– Get the songs from the WFMU blog. This week at the show, I’m presenting Sakura and the Quests. 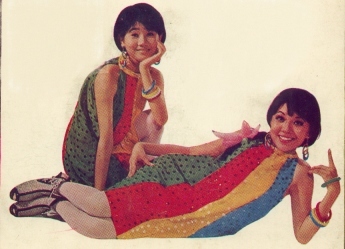 They’re from Singapore and the late 60s, and are in fact a pop singer (Sakura Teng 櫻花) and the band with whom she was playing for the time of this recording. In the album (that you can get from here-above url), you will find a cover of Michelle, and various other covers of English songs from that period. Why is it so interesting? The kitschy feel of the sixties in Chinese, of course!